All good things must come to an end, we’re told, and macOS 10.13 was the very end of the original FileVault, Apple's file encryption format introduced in OS X Panther 10.3. With the original FileVault, a Mac encrypted a user’s home directory and mounted it as a disk image, more or less. When OS X Lion 10.7.4 appeared, it offered FileVault 2, full disk encryption (FDE), which protects your entire drive by using a special startup procedure at boot time that lets you log in to unlock it. It’s much better than the original directory method, but it required faster Macs to work efficiently enough. But what about people who, like Macworld reader Alex, had legacy FileVault directories still installed? For many releases, you could use the Security & Privacy system preference pane: click on FileVault and click Turn Off Legacy FileVault. But starting in macOS 10.13 High Sierra, legacy FileVaults no longer work. 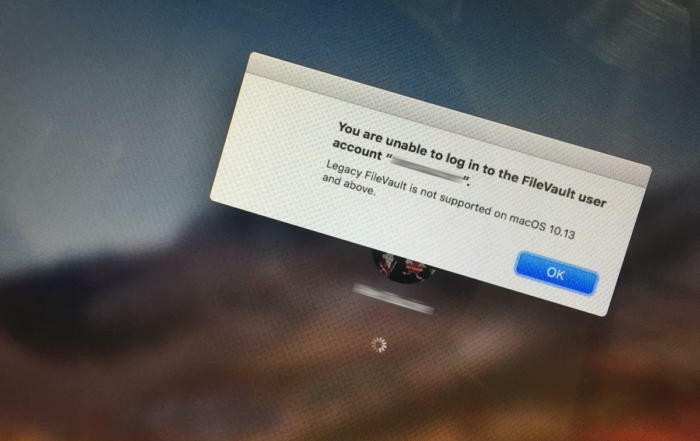 Something was askew with a Macworld reader’s legacy FileVault account: it shouldn’t even be possible. While that won’t restore the account on that Mac, it will allow him to extract any files. He could then either restart on that Mac with another account and create a new account to which he copies the formerly encrypted files or use Recovery to create a new account. If someone in this situation has a Time Machine backup, it may also be possible to find and retrieve the disk image on the active High Sierra Mac and decrypt that there. Let us know at mac911@macworld.com if you encounter this or find other solutions—it seems like it shouldn’t happen at all.